Describe the Federalists Papers, identify who wrote them, and identify the purpose of the publications. Be sure to identify some of the most significant Federalist Papers as well as identifying their arguments. Finally, describe the rivalry that developed between Hamilton and Jefferson that led to the the "federalists" and "anti-federalists" sections. Suppported removing some powers from states and giving more powers to the national government. Wanted important poltical powers to remain witht he states. Believed a bill of rights needed to be used to the Constittution to protect peoples' rights. 1789, the United States was a nation in name only as people still thought of themselves as citizens of their state first and then the nation. As a result of the weakness of the Articles of Confederation the majority of the people realized the need for a new and stronger government BUT everyone was not in agreement as to how much power the new government should have It is important to keep in mind that the country was large and sparsely settled, that communication was slow, and that the central government did not influence the lives of most people to any great degree. Many persons, including some who had been in the forefront of the struggle for independence believed that a centralized republican system would not work in a country so large and with so many varied interests as the United States. These opponents of the Constitution were called Anti-federalists who drew their support primarily from rural areas with subsistence agriculturally based economies, but their leaders came from all regions and classes. government would be controlled by the wealthy and thus would be controlled by the wealthy and thus would remove the control of government from the people. The ANTIFEDERALISTS were a diverse coalition of people who opposed ratification of the Constitution. Although less well organized than the Federalists, they also had an impressive group of leaders who were especially prominent in state politics. Ranging from political elites like JAMES WINTHROP in Massachusetts to MELANCTON SMITH of New York and Patrick Henry and George Mason of Virginia, these Antifederalist were joined by a large number of ordinary Americans particularly yeomen farmers who predominated in rural America. The one overriding social characteristic of the Antifederalists as a group was their strength in newer settled western regions of the country. In spite of the diversity that characterized the Antifederalist opposition, they did share a core view of American politics. They believed that the greatest threat to the future of the United States lay in the government's potential to become corrupt and seize more and more power until its tyrannical rule completely dominated the people. Having just succeeded in rejecting what they saw as the TYRANNY of British power, such threats were seen as a very real part of political life. To Antifederalists the proposed Constitution threatened to lead the United States down an all-too-familiar road of political CORRUPTION. All three branches of the new central government threatened Antifederalists' traditional belief in the importance of restraining government power. The President's vast new powers, especially a veto that could overturn decisions of the people's representatives in the legislature, were especially disturbing. The court system of the national government appeared likely to encroach on local courts. Meanwhile, the proposed lower house of the legislature would have so few members that only elites were likely to be elected. Furthermore, they would represent people from such a large area that they couldn't really know their own constituents. The fifty-five members of the proposed national House of Representatives was quite a bit smaller than most state legislatures in the period. Since the new legislature was to have increased fiscal authority, especially the right to raise taxes, the Antifederalists feared that before long Congress would pass oppressive taxes that they would enforce by creating a standing national army. The supporters of the proposed Constitution called themselves "FEDERALISTS." Their adopted name implied a commitment to a loose, decentralized system of government. In many respects "FEDERALISM" — which implies a strong central government — was the opposite of the proposed plan that they supported. A more accurate name for the supporters of the Constitution would have been "NATIONALISTS." The "nationalist" label, however, would have been a political liability in the 1780s. Traditional political belief of the Revolutionary Era held that strong centralized authority would inevitably lead to an abuse of power. The Federalists were also aware that that the problems of the country in the 1780s stemmed from the weaknesses of the central government created by the Articles of Confederation. For Federalists, the Constitution was required in order to safeguard the liberty and independence that the American Revolution had created. While the Federalists definitely had developed a new political philosophy, they saw their most import role as defending the social gains of the Revolution. As James Madison, one of the great Federalist leaders later explained, the Constitution was designed to be a "republican remedy for the diseases most incident to republican government." This range of objections boiled down to a central opposition to the sweeping new powers of the proposed central government. George Mason, a delegate to the Philadelphia Convention who refused to support the Constitution, explained, the plan was "totally subversive of every principle which has hitherto governed us. This power is calculated to annihilate totally the state governments." The rise of national power at the expense of state power was a common feature of Antifederalist opposition. The most powerful objection raised by the Antifederalists, however, hinged on the lack of protection for INDIVIDUAL LIBERTIES in the Constitution. Most of the state constitutions of the era had built on the Virginia model that included an explicit protection of individual rights that could not be intruded upon by the state. This was seen as a central safeguard of people's rights and was considered a major Revolutionary improvement over the unwritten protections of the British constitution. Why, then, had the delegates to the Philadelphia Convention not included a bill of rights in their proposed Constitution? Most Antifederalists thought that such protections were not granted because the Federalists represented a sinister movement to roll back the gains made for ordinary people during the Revolution. The Antifederalists and Federalists agreed on one thing: the future of the nation was at stake in the contest over the Constitution. The Federalists had more than an innovative political plan and a well-chosen name to aid their cause. Many of the most talented leaders of the era who had the most experience in national-level work were Federalists. For example the only two national-level celebrities of the period, Benjamin Franklin and George Washington, favored the Constitution. In addition to these impressive superstars, the Federalists were well organized, well funded, and made especially careful use of the printed word. Most newspapers supported the Federalists' political plan and published articles and pamphlets to explain why the people should approve the Constitution. In spite of this range of major advantages, the Federalists still had a hard fight in front of them. Their new solutions were a significant alteration of political beliefs in this period. Most significantly, the Federalists believed that the greatest threat to the future of the United States did not lie in the abuse of central power, but instead could be found in what they saw as the excesses of democracy as evidenced in popular disturbances like Shays' Rebellion and the pro-debtor policies of many states. The supporters of the new constitution called themselves Federalists. The Federalist Papers consist of eighty-five letters written to newspapers in the late 1780s to urge ratification of the U.S. Constitution. These are a series of eighty-five letters written to newspapers in 1787-1788 by Alexander Hamilton, James Madison, and John Jay, urging ratification of the Constitution.After a new Constitution, intended to replace the ineffectual Articles of Confederation, had been hammered out at the Philadelphia Convention, it was agreed that it would go into effect when nine of the thirteen states had approved it in ratifying conventions. With the Constitution needing approval from nine of thirteen states, the press was inundated with letters about the controversial document. Celebrated statesmen Alexander Hamilton, James Madison and John Jay weighed in with a series of essays under the pseudonym “Publius,” arguing that the proposed system would preserve the Union and empower the federal government to act firmly and coherently in the national interest. These articles, written in the spirit both of propaganda and of logical argument, were published in book form as The Federalist in 1788. 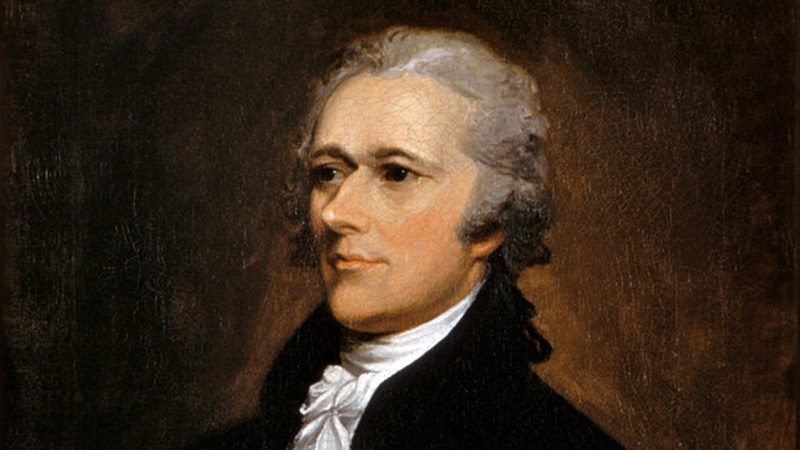 There ensued a nationwide debate over constitutional principles, and the press was inundated with letters condemning or praising the document, among them these articles, signed “Publius.”The three men—chief among them Hamilton, who wrote about two-thirds of the essays—addressed the objections of opponents, who feared a tyrannical central government that would supersede states’ rights and encroach on individual liberties. All strong nationalists, the essayists argued that, most important, the proposed system would preserve the Union, now in danger of breaking apart, and empower the federal government to act firmly and coherently in the national interest. Conflicting economic and political interests would be reconciled through a representative Congress, whose legislation would be subject to presidential veto and judicial review. This system of checks and balances and the Constitution’s clear delineation of the powers of the federal government—few, limited, and defined, as Madison put it—would protect states’ rights and, as they saw it, individual rights. The ultimate protection of individual liberties had to wait for later passage of the Bill of Rights, for these men, as their arguments made plain, distrusted what Madison called “the superior force of an interested and overbearing majority.” Many of the constitutional provisions they praised were intended precisely to dampen democratic “excesses.”The articles, written in the spirit both of propaganda and of logical argument, probably had little influence on public opinion of the day. Nevertheless, the essays, published in book form as The Federalist in 1788, have through the years been widely read and respected for their masterly analysis and interpretation of the Constitution and the principles upon which the government of the United States was established. Madison suggested that the great size and social diversity of the United States would safeguard republican government rather than destroy it. He argued that the great number of interest groups would diffuse power and prevent tyranny. The Federalists also argued that the new government would provide economic, social and political stability; something that the government under the Articles could not provide. military officers, diplomats, and officials who had served in the Continental Congress during the war. These men had acquired a national, rather than a state or local outlook. Each branch, they argued would created a "check and balance" the others and thus preserve liberty and state sovereignty. In total, the Federalist Papers consist of 85 essays outlining how this new government would operate and why this type of government was the best choice for the United States of America. All of the essays were signed "PUBLIUS" and the actual authors of some are under dispute, but the general consensus is that Alexander Hamilton wrote 52, James Madison wrote 28, and John Jay contributed the remaining five. The Federalist Papers remain today as an excellent reference for anyone who wants to understand the U.S. Constitution. We have three ways to browse the Federalist Papers. Thee first two are both in numerical order. Frames make it slightly easier to flip back and forth between different pages. The third is by author. The ratification process started when the Congress turned the Constitution over to the state legislatures for consideration through specially elected state conventions of the people. Five state conventions voted to approve the Constitution almost immediately (December 1787 to January 1788) and in all of them the vote was unanimous (Delaware, New Jersey, Georgia) or lopsided (Pennsylvania, Connecticut). Clearly, the well-organized Federalists began the contest in strong shape as they rapidly secured five of the nine states needed to make the Constitution law. The Constitution seemed to have easy, broad, and popular support. However, a closer look at who ratified the Constitution in these early states and how it was done indicates that the contest was much closer than might appear at first glance. Four of the five states to first ratify were small states that stood to benefit from a strong national government that could restrain abuses by their larger neighbors. The process in Pennsylvania, the one large early ratifier, was nothing less than corrupt. ThePENNSYLVANIA STATE ASSEMBLY was about to have its term come to an end, and had begun to consider calling a special convention on the Constitution, even before Congress had forwarded it to the states. Antifederalists in the state assembly tried to block this move by refusing to attend the last two days of the session, since without them there would not be enough members present for the state legislature to make a binding legal decision. As a result extraordinarily coercive measures were taken to force Antifederalists to attend. Antifederalists were found at their boarding house and then dragged through the streets of Philadelphia and deposited in the Pennsylvania State House with the doors locked behind them. The presence of these Antifederalists against their will, created the required number of members to allow a special convention to be called in the state, which eventually voted 46 to 23 to accept the Constitution. The first real test of the Constitution in an influential state with both sides prepared for the contest came in Massachusetts in January 1788. Here influential older Patriots like GOVERNOR JOHN HANCOCK and Sam Adams led the Antifederalists. Further, the rural western part of the state, where Shays' Rebellion had occurred the previous year, was an Antifederalist stronghold. A bitterly divided month-long debate ensued that ended with a close vote (187-168) in favor of the Constitution. Crucial to this narrow victory was the strong support of artisans who favored the new commercial powers of the proposed central government that might raise tariffs (taxes) on cheap British imports that threatened their livelihood. The Federalists' narrow victory in Massachusetts rested on a cross-class alliance between elite nationalists and urban workingmen. The Massachusetts vote also included an innovation with broad significance. John Hancock who shifted his initial opposition to the Constitution led the move toward ratification. Satisfied that certain amendments protecting individual rights were going to be considered by the first new Congress that would meet should the Constitution become law. This compromise helped carry the narrow victory in Massachusetts and was adopted by every subsequent state convention to ratify (except Maryland). By the spring conventions in the required nine states had ratified, and the Constitution could become law. But with powerful, populous, and highly divided Virginia and New York yet to vote, the legitimacy of the new national system had not yet been fully resolved. The convention in Virginia began its debate before nine states had approved the Constitution, but the contest was so close and bitterly fought that it lasted past the point when the technical number needed to ratify had been reached. Nevertheless, Virginia's decision was crucial to the nation. Who can imagine the early history of the United States if Virginia had not joined the union? What if leaders like George Washington, Thomas Jefferson, and James Madison had not been allowed to hold national political office? In the end Virginia approved the Constitution, with recommended amendments, in an especially close vote (89-79). Only one major state remained, the Constitution was close to getting the broad support that it needed to be effective. Perhaps no state was as deeply divided as New York, where the nationalist-urban artisan alliance could strongly carry New York City and the surrounding region, while more rural upstate areas were strongly Antifederalist. The opponents of the Constitution had a strong majority when the convention began and set a tough challenge for ALEXANDER HAMILTON, the leading New York Federalist. Hamilton managed a brilliant campaign that narrowly won the issue (30-27) by combining threat and accommodation. On the one hand, he warned that commercial down state areas might separate from upstate New York if it didn't ratify. On the other hand, he accepted the conciliatory path suggested by Massachusetts; amendments would be acceptable after ratification. The debate in New York produced perhaps the most famous exploration of American political philosophy, now calledTHE FEDERALIST PAPERS. Originally, they were a series of 85 anonymous letters to newspapers, which were co-written by Alexander Hamilton, James Madison, andJOHN JAY. Together they tried to assure the public of the two key points of the Federalist agenda. First, they explained that a strong government was needed for a variety of reasons, but especially if the United States was to be able to act effectively in foreign affairs. Second, it tried to convince readers that because of the "separation" of powers in the central government, there was little chance of the national government evolving into a tyrannical power. Instead of growing ever stronger, the separate branches would provide a "CHECK AND BALANCE" against each other so that none could rise to complete dominance. The influence of these newspaper letters in the New York debate is not entirely known, but their status as a classic of American political thought is beyond doubt. Although Hamilton wrote the majority of the letters, James Madison authored the ones that are most celebrated today, especially FEDERALIST, NUMBER 10. Here Madison argued that a larger republic would not lead to greater abuse of power (as had traditionally been thought), but actually could work to make a large national republic a defense against tyranny. Madison explained that the large scope of the national republic would prevent local interests from rising to dominance and therefore the larger scale itself limited the potential for abuse of power. By including a diversity of interests (he identified agriculture, manufacturing, merchants, and creditors, as the key ones), the different groups in a larger republic would cancel each other out and prevent a corrupt interest from controlling all the others. Madison was one of the first political theorists to offer a profoundly modern vision of self-interest as an aspect of human nature that could be employed to make government better, rather than more corrupt. In this he represents a key figure in the transition from a traditional republican vision of America, to a modern LIBERAL one where self-interest has a necessary role to play in public life. With the narrow approval of the Constitution in Virginia and New York, in June and July 1788, respectively, the Federalists seemed to have won an all-out victory. The relatively small states of North Carolina and Rhode Island would hold out longer, but with 11 states ratifying and all the populous ones among them, the Federalists had successfully waged a remarkable political campaign of enormous significance and sweeping change. The ratification process included ugly political manipulation as well as brilliant developments in political thought. For the first time, the people of a nation freely considered and approved their form of government. It was also the first time that people in the United States acted on a truly national issue. Although still deciding the issue state-by-state, everyone was aware that ratification was part of a larger process where the whole nation decided upon the same issue. In this way, the ratification process itself helped to create a national political community built upon and infusing loyalty to distinct states. The development of an American national identity was spurred on and closely linked to the Constitution. The Federalists' efforts and goals were built upon expanding this national commitment and awareness. But the Antifederalists even in defeat contributed enormously to the type of national government created through ratification. Their key objection challenged the purpose of a central government that didn't include specific provisions protecting individual rights and liberties. Since the new national government was even more powerful and even more distant from the people, why didn't it offer the kinds of individual protections in law that most state constitutions had come to include by 1776? To the Antifederalists, the SEPARATION OF POWERS was far too mild a curb against the threat of government tyranny. As a result states beginning with Massachusetts ratified the Constitution, but called for further protections to be taken up by the new Congress as soon as it met. This loomed on the unresolved political agenda of the national Congress and the adoption of the BILL OF RIGHTS (the first ten AMENDMENTS to the Constitution) is a legacy of the victory-in-defeat of Antifederalists. Their continued participation in the political process even when they seemed to have lost on the more general issue had immense importance. The Constitution was created out of a tough-minded political process that demanded hard work, disagreement, compromise, and conflict. Out of that struggle the modern American nation took shape and would continue to be modified. Although debates continued, Washington’s election as president, and the first eight years of functioning government during his administration, cemented the Constitution’s authority. By 1793, the term “Anti-Federalist” would be essentially meaningless. Yet the debates produced a piece of the Constitution that seems irreplaceable today. Ten amendments to the Constitution were added in 1791. Together, they constitute the Bill of Rights. James Madison, against his original wishes, supported these amendments as an act of political compromise and necessity. He had won election to the House of Representatives only by promising his Virginia constituents such a list of rights. There was much the Bill of Rights did not cover. Women found here no special protections or guarantee of a voice in government. Many states would continue to restrict voting only to men who owned significant amounts of property. And slavery not only continued to exist; it was condoned and protected by the Constitution. Of all the compromises that formed the Constitution, perhaps none would be more important than the compromise over the slave trade. Americans generally perceived the Atlantic slave trade (the process of shipping enslaved Africans to the Western Hemisphere) as more violent and immoral than slavery itself. Many Northerners opposed it on moral grounds. But they also understood that letting Southern states import more Africans would increase their political power. The Constitution counted each black individual as three-fifths of a person for purposes of representation, so in districts with many slaves, the white voters had extra influence. On the other hand, the states of the Upper South also welcomed a ban on the Atlantic trade because they already had a surplus of slaves. Banning importation meant slaveowners in Virginia and Maryland could get higher prices when they sold slaves in America. States like South Carolina and Georgia, however, were dependent upon a continued slave trade. New England and the Deep South agreed to what was called a “dirty compromise” at the Constitutional Convention in 1787. New Englanders agreed to include a constitutional provision that protected the foreign slave trade for twenty years; in exchange, South Carolina and Georgia delegates had agreed to support a constitutional clause that made it easier for Congress to pass commercial legislation. As a result, the Atlantic slave trade resumed until 1808 when it was outlawed for three reasons. First, Britain was also in the process of outlawing the slave trade in 1807, and the United States did not want to concede any moral high ground to its rival. Second, the Haitian Revolution (1791–1804), a successful slave revolt against French colonial rule in the West Indies, had changed the stakes in the debate. The image of thousands of armed black revolutionaries terrified white Americans. Third, the Haitian Revolution had ended France’s plans to expand its presence in the Americas, so in 1803, the United States had purchased the Louisiana Territory from the French at a fire-sale price. This massive new territory, which had doubled the size of the United States, had put the question of slavery’s expansion at the top of the national agenda. Many white Americans, including President Thomas Jefferson, thought that ending the external slave trade and dispersing the domestic slave population would keep the United States a white man’s republic and perhaps even lead to the disappearance of slavery. The ban on the slave trade, however, lacked effective enforcement measures and funding. Moreover, instead of freeing illegally imported Africans, the act left their fate to the individual states, and many of those states simply sold intercepted slaves at auction. Thus, the ban preserved the logic of property ownership in human beings. The new federal government protected slavery as much as it expanded democratic rights and privileges for white men. Alexander Hamilton saw America’s future as a metropolitan, commercial, industrial society, in contrast to Thomas Jefferson’s nation of small farmers. While both men had the ear of President Washington, Hamilton’s vision proved most appealing and enduring. Meanwhile, during George Washington’s presidency, political trouble was already brewing. Washington’s cabinet choices reflected continuing tension between politicians who wanted and who feared a powerful national government. The vice president was John Adams, and Washington chose Alexander Hamilton to be his secretary of the treasury. Both men wanted an active government that would promote prosperity by supporting American industry. However, Washington chose Thomas Jefferson to be his secretary of state, and Jefferson was committed to restricting federal power and preserving an economy based on agriculture. Almost from the beginning, Washington struggled to reconcile the “Federalist” and “Republican” (or Democratic-Republican) factions within his own administration. View the following video and read the following article to describe the rivalry that developed between Hamilton and Jefferson that led to the the "federalists" and "anti-federalists" sections.